Screengrab from Click2Houston.com. Seems legit. Rick Dyer released these photos on Thursday of what he says is proof that the mystical creature does, or at least did exist, before he shot and killed it. The legend chaser told our affiliate station, KSAT, that he shot and killed the creature while camping in a wooded area on the northwest side near Loop 1604 and Highway 151 in early September 2012. Cool story, Rick, I’m sure it’s just as true as the story told by the guy who exhibited the dead Sasquatch my dad took me to see at 100 Oaks Mall in Nashville in 1978. Dead, iced-up Bigfoots all over the damn place, for decades now, apparently. One hopes Mr. Dyer put the poor creature on ice. Bigfoots are legendarily stinky, and one that’s been dead longer than a year surely smells worse than a live specimen. 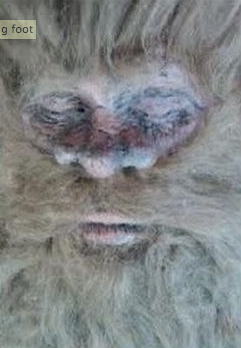 I can’t even bring myself to discuss the hirsute dead hobo possibility, because I don’t want to live in that world. Though I kind of do.